In Kansas you just never know what you will get. Around here it is said “If you don’t like the weather, stick around it will change.” And, as I said before, it is officially spring. Monday March 24, we had more snow and it was blowing hard enough that it was difficult to see even though it was a light snow. Thankfully we only got about half an inch. Maybe an inch. It was gone by mid afternoon. Tuesday March 25, I really can’t remember what the weather was like. Seems like it was a little breezy, but not too cold. Wednesday and Thursday, March 26 and 27 was WINDY! Fifty mph to be specific with the wind gusts. It was up in the forties, I think both days, but it felt colder. Yesterday, Thursday, we had to move in three bales of hay. One for the horses/donkey, one for the weanling calves and one for the big cows out in the pasture. Hubby usually runs the tractor and I usually cut open the bales and pull strings. Although I have done both, sometimes by myself. 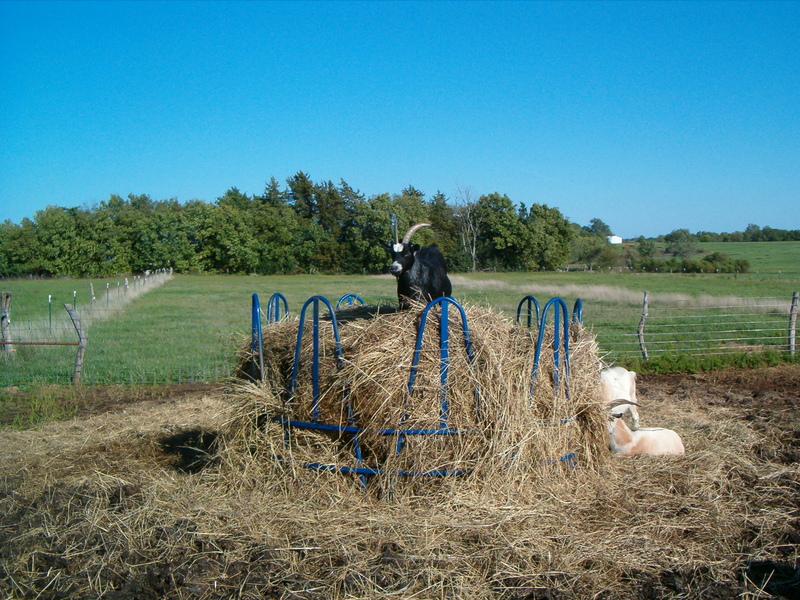 It is hard to keep dirty hay from the outer layers from getting in your mouth on a windy day. I concentrate hard on keeping my mouth closed and my coat zipped up all the way to keep hay from blowing down my shirt. That gets kind of itchy, and I know it is not lady like to spit, but I do a lot of it on these kinds of days. And it is not unusual on a warm day riding the ATV out to check on things in the pasture that I forget to keep my mouth close and not sing or laugh at something when flies are buzzing about. Yes, I have swallowed a fly or two in the past. I don’t recommend it. It is a good thing no one is close by. I gag, spit and snarl a lot. Poor Sandy was with me a few times on the ATV, she likes to ride with me, and she looked back at me like I had done gone around the bend. Thursday also called for Thunderstorms and a Tornado watch. Thankfully nothing came about in our area, but Missouri and eastern Kansas got some bad weather. After the drought two summers ago we still need quite a bit of rain. I am just not ready for the bad storms and Tornadoes that inevitably come with spring weather. And usually we get not enough rain or too much. Once in a great while we get just the right amount. Last summer we had one of the just right amounts. The wheat crops and our hay crop were bumper crops. The winter before we ran out of hay and the prices soared. It may have been two winters ago, but which ever, this year we had enough to even sell some to a lady and her husband that I know and still have enough left over to feed my horses and any cows that may have to be penned separate. We are hoping and praying for a good crop of hay this year as well. If we have another winter like this one, we will need it. Today is not too bad. The wind is very light and it is around the forties. It is cloudy and you still need a light jacket or sweatshirt, but it is nicer than the rest of the week. If the sun was out it would be about as perfect a day as I would like. 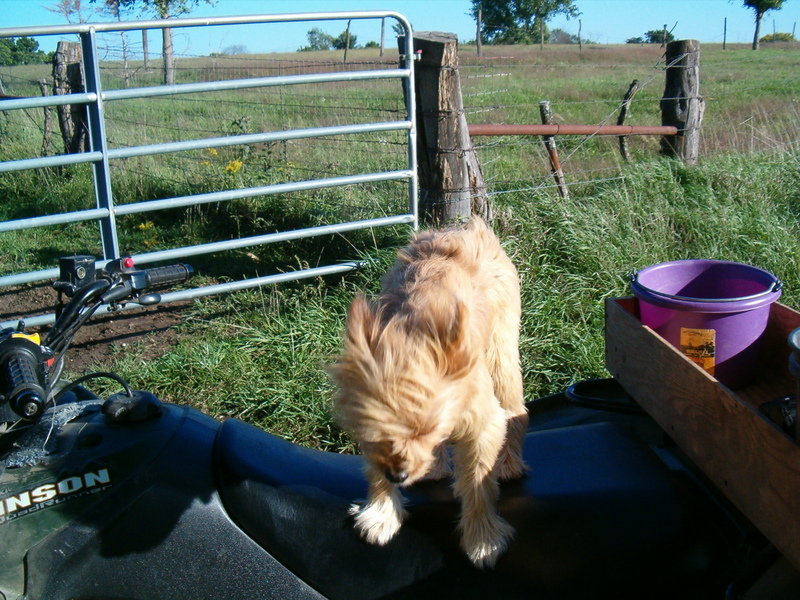 This is an older picture of Sandy on the ATV. It was one of our many windy days. 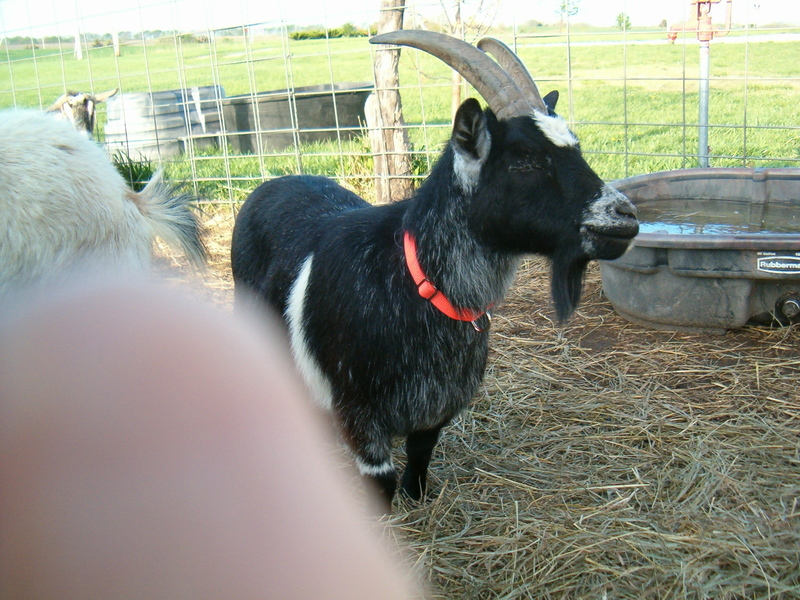 Looking for this picture I came across these pictures of my goats that I used to have. I miss them sometimes. 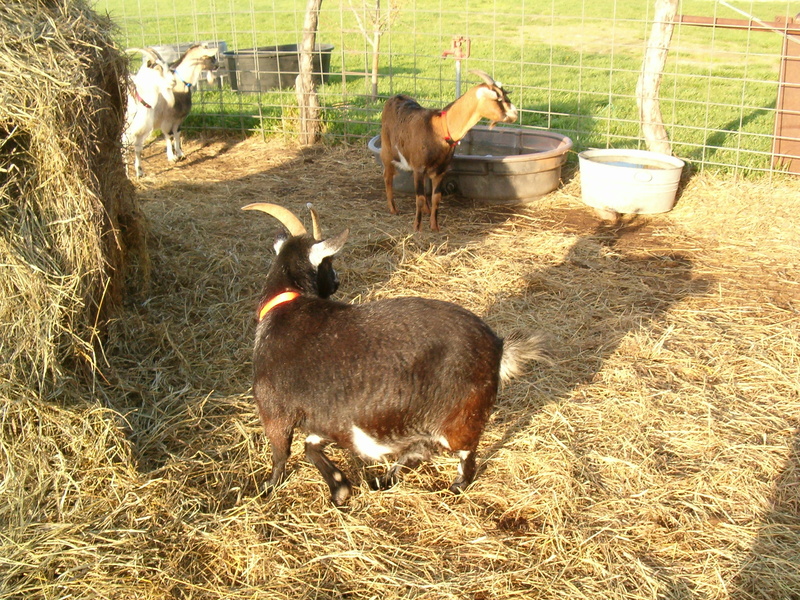 Especially Molly, the black goat, and Ilean. She had only three legs. The previous owners said she tried to climb a fence and broke her leg pretty badly. It had to be amputated. But she was the matriarch of the bunch and she could run as fast as any of them. 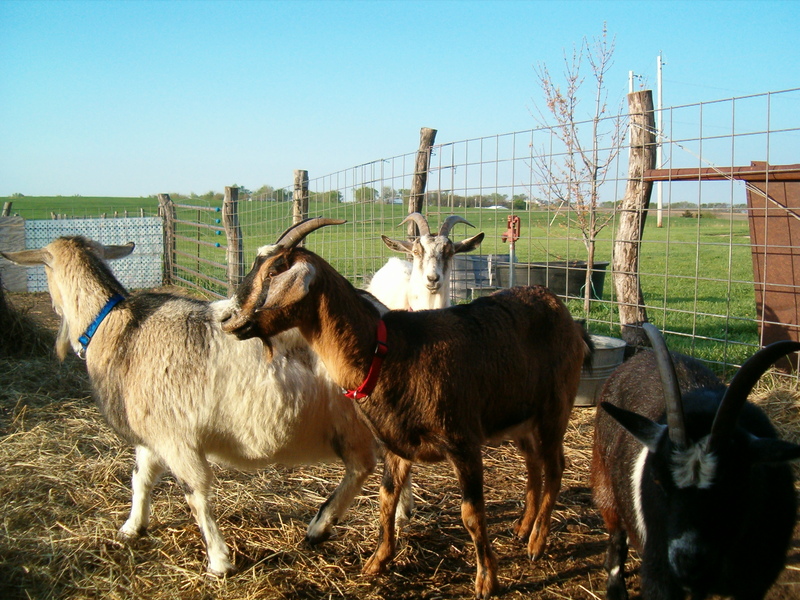 This first picture is Ilean, the one in the middle, BG (Brown Girl) and Capachino. They came with the names. 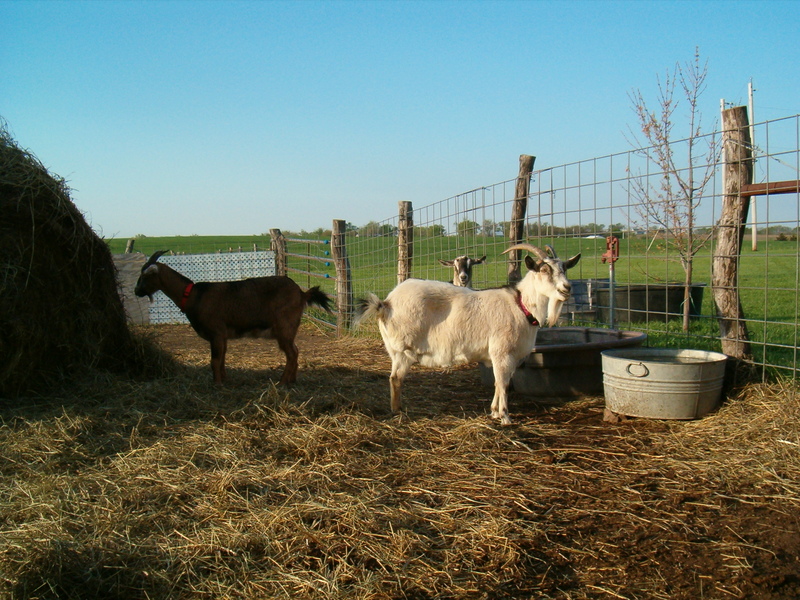 This one is of Molly, BG and the other two in the back ground. My Mini in the background. 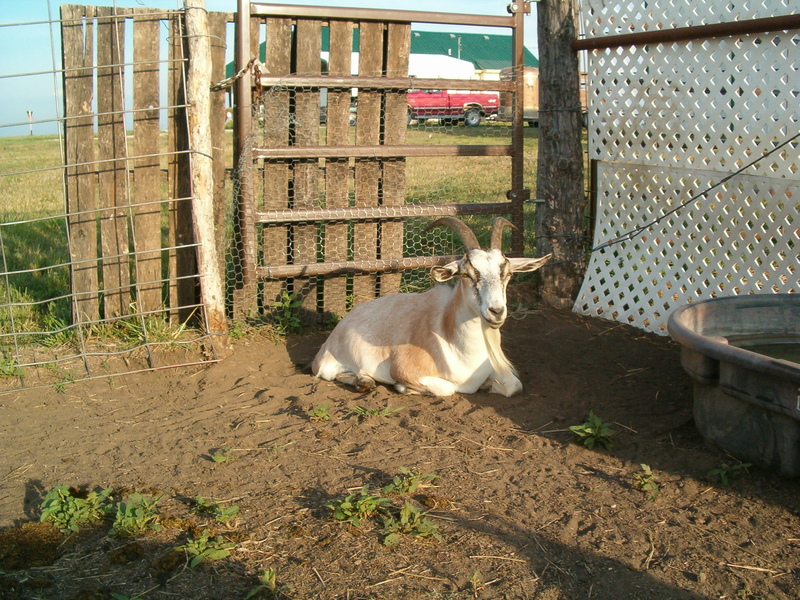 Goats really do like to climb on everything. And if they want out, they will get out. 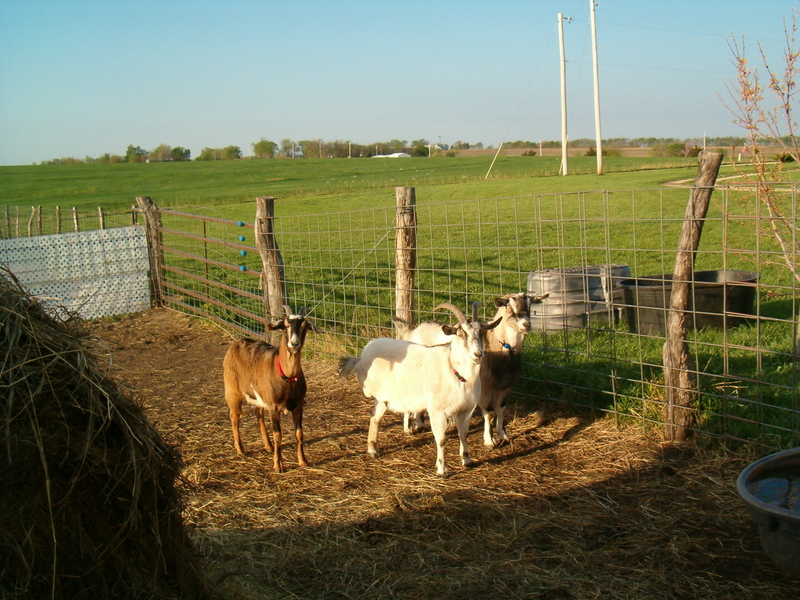 The only way we finally could keep them in was to run a hot wire around the bottom of the fences. The first time any of them found it, they gave a very surprised bleat! It was funny in a way but I did feel sorry for them at the same time. I have had experience with touching a hot wire and it is not pleasant. Gets your heart to pumping if it is strong enough. But it only took once (in every corner) to try to get out. They stayed in from then on. Well, I kind of think I jumped around a little but what the hey. I am good at that if nothing else. I really should go for a walk, before the wind changes again. But I probably won’t. I will need to go out and help fill the water tanks and get the chickens back into the pen. I haven’t been letting them out since the last two that were killed by a coyote. Or something. I felt sorry for them last night while we were out putting in hay. 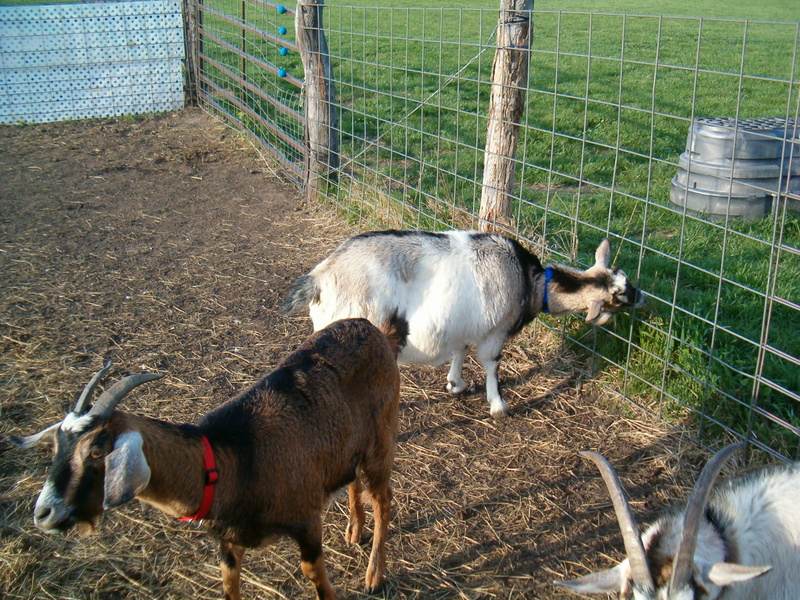 They have been trying to get out every time I open the pen gate. So I let them out and they had a hay day scratching around and enjoying their short freedom. I let them out again this afternoon since Hubby was out to burn trash and our dogs were out for awhile too. 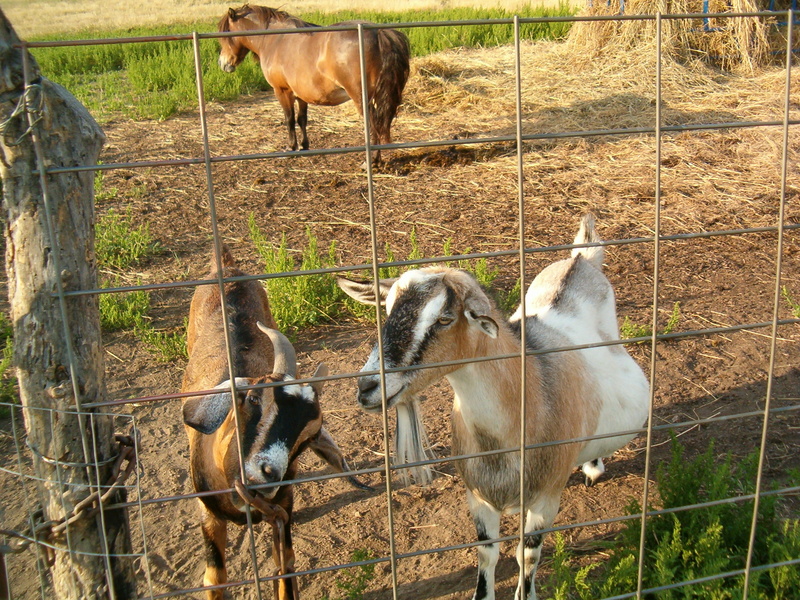 They were over by the horse pen when I came back in. They will be pretty safe there if they will stay put. That is of course if one of the beasties don’t decide to be nasty and take a kick at them. I have seen my mare do that if she is grumpy. Usually she misses but I have heard a chicken squawk now and then. Gotta go now. I am not going to take time to review this this time, so I apologize for any problems with my typing. ← Spring is FINALLY Here! I am all tomboy! And spittin’ is part of that. Lol!